Tucked within Hotel Bel-Air surrounded by 12 lush acres of gardens, Hotel Bel-Air Spa is a quiet, luxurious hideaway where Angelenos go for total privacy when they need to unwind. The hotel has been a favorite of celebrities and high-profile guests since 1946, and the equally private spa, which was added to the property in 2011, has become a go-to spot for VIPs, too. Mirroring the rest of the hotel’s glamorous inspired-by-nature design, the spa features warm red oak floors, hand-painted walls, three-dimensional floral ceilings and creamy cashmere throws on velvet chaise lounges. State-of-the-art facilities include seven treatment rooms plus a steam room, private nail salon, relaxation lounge and an adjacent 24-hour fitness studio. For a truly unique experience, couples (and groups of up to 12) can book The Enclave, a 570-square-foot private treatment suite with its own tropical shaded outdoor patio, plus room service, a grand soaking tub and a soothing waterfall. Each creamy-hued treatment room is decked in hand-painted wallpaper and features heated and padded tables, temperature controls and a variety of different music options, from nature soundscapes to classical music to indie pop, if you so choose. Facials are the specialty here, where signature Valmont products and techniques are used to revitalize your skin. Enjoy the red carpet treatment with the Vitality of the Stars, a Hotel Bel-Air Spa exclusive that uses LED and microcurrent technology to renew and restore your complexion to a youthful glow. Much like the legendary hotel, the spa is all about quiet luxury. While the black reception desk may be covered in Swarovski crystals, the facilities are awash in airy creams and golds. Splurge on the age-defying skincare line Valmont at the onsite boutique, but the best part of visiting this spa is getting a treatment featuring the ultra-luxe Swiss products so you can test before you invest. A refreshment cart displays fruit-infused water, nuts and a fruit mix, but we suggest ordering from the Wolfgang Puck restaurant menu and taking a light bite on the patio before leaving the luxurious surroundings. Some of the treatments (like most of the massages and nail services) may be booked in your hotel room by request. If you’re traveling with your partner, we recommend booking one of the couples’ treatments. 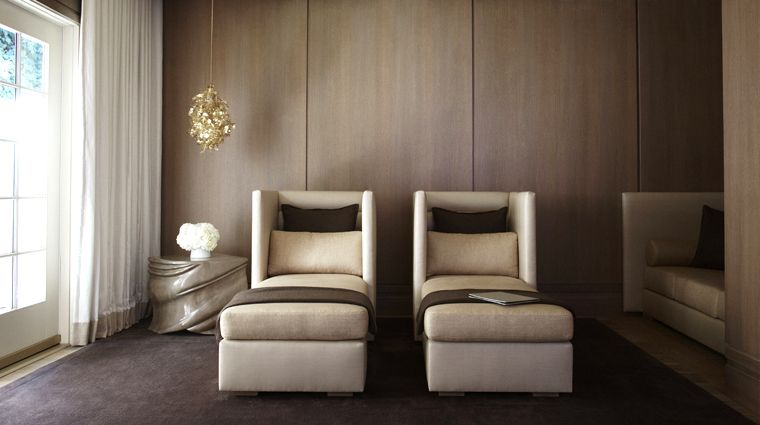 These take place in a private suite that includes a comfortable outdoor patio where you can relax after your treatments. You can’t go wrong with one of the facials here, as all use Valmont products and are designed to generate real results and feel amazing. The deep-tissue massage was one of the best we’ve ever had. The therapist completely focused on our areas of concern and worked hard to get out all of our knots, even jumping up on the table at one point. In addition to separate relaxation lounges attached to both the men’s and women’s locker rooms, there is a coed relaxation room that looks out over an intimate outdoor patio. 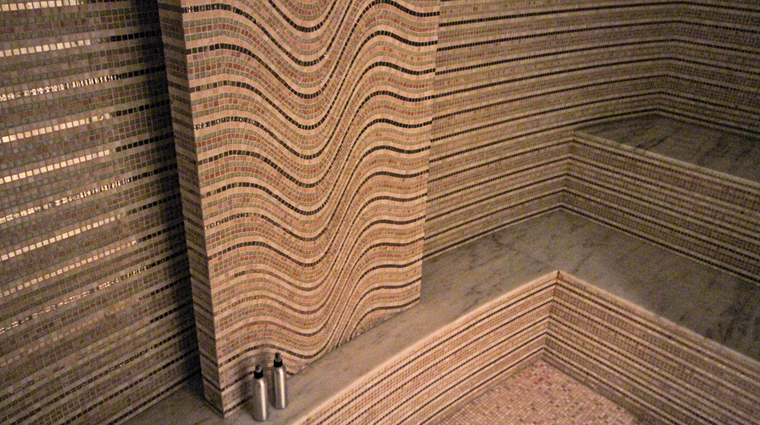 Locker room highlights include the private marble rain showers and a mosaic-tiled steam room with twinkling LED lights. The relaxation room has a few plush loungers, wood-paneled walls, gilded accents and a view (through French doors) of the outdoor patio surrounded by a wall covered in greenery.